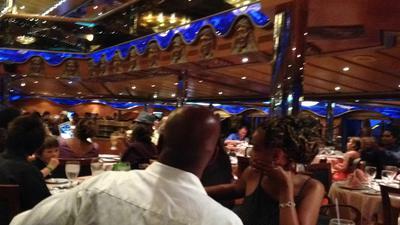 My fall cruise aboard Carnival Victory was overall a super getaway. 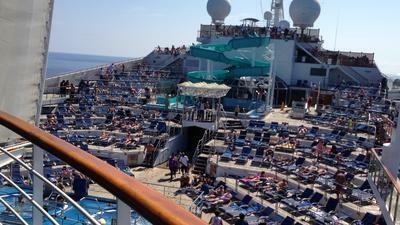 Our cruise was a 5-day itinerary from the Port of Miami to Ocho Rios, Jamaica and Grand Cayman, Cayman Islands. This was my fifth Carnival cruise and so I had expected to have a good time. I was not disappointed. As expected, checking in was fine. We arrived at the port between 12:30 and 1 p.m. and found an easy flowing line. By the time we arrived on the ship, our cabins were ready and so we were able to unload before heading to the Lido Deck for lunch. One of the first things I look for upon boarding a cruise ship is the lobby area and atrium. I knew getting on that Carnival Victory was an older ship, and also that it was similar to Carnival Destiny (now "Sunshine"), which I had sailed on three years ago. Quite frankly, I was not blown away by the atrium but it was fine. While the atrium was not better than others I had seen, the rest of the ship was in tip top condition, given its age. I was impressed with the beauty of the Adriatic Lounge, the Caribbean Lounge (main area for nightly shows) and the dining rooms. We ate in the Atlantic Dining Room, which was as beautiful as other Carnival dining rooms we have seen. As expected, the food onboard the Victory was fine. The ship offers two main dining rooms, a buffet court, a deli, a grill, an Asian outlet, a coffee and pastries shop (additional charge) and a steakhouse. We are always appreciative of the different cuisines offered on any cruise ship vacation with Carnival Cruise Lines and with how well decorated meals served in the main dining rooms are. The chefs did not disappoint. As far as entertainment went, the Victory was not short on good offers. The Cruise Director, Marcelo, did a fantastic job leading off planned activities and humoring the guests. His entertainment team was quite adept at getting guests involved in various scheduled activities. As for the children (not too many since it was fall), Camp Carnival delivered. Our eight year old daughter had good things to say. I was also impressed with the video arcade for the older children. I have seen other less impressive video arcades on other ships. Sadly, I did not think that there was much for older children to do. Yes, there was a miniature golf course, a ping pong table and the video arcade. However, I thought a basketball court would have hit the spot. I even identified the perfect spot for it - the rear end of the jogging track. Anyway, there were many other things to do onboard Carnival Victory. The ship has three (3) pools on the Lido Deck, along with five (5) hot tubs. Also, there is a giant TV screen on which newly released movies were shown. Some movies shown on this trip included Captain America, X-Men and Transformers. In addition, guests had a fitness center, a spa, a library, and even an art gallery from which to choose. Ports of call are quite important on any cruise ship vacation, and we visited two of the most popular Caribbean ports - Ocho Rios, Jamaica and Grand Cayman, Cayman Islands. We did this same itinerary three years ago, and this time I was pleased to see some improvements to the area near the Ocho Rios Cruise Terminal. There is some new landscaping, and undeveloped land outside the terminal gate is now well developed. Much has been done in three years. Grand Cayman did not have changes - as far I noticed. 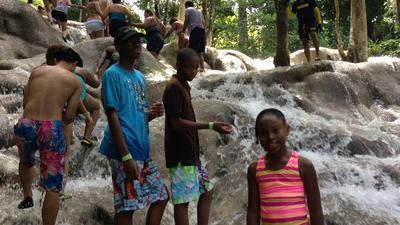 In Jamaica, we did the best thing - visited and climbed Dunn's River Falls. 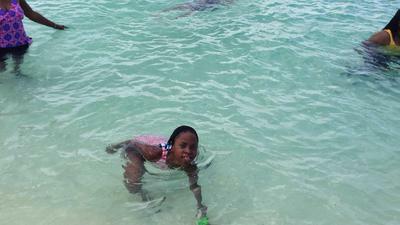 And for Grand Cayman, we did a tour and then spent time at the beautiful 7 Mile Beach. What a beautiful beach! Overall, the weather on this Carnival Victory fall cruise getaway was fantastic. The Caribbean temperatures were not scorching and there was no rain. Instead, each port of call had a light, cool breeze that added to the fun. If you are thinking of a Carnival Victory cruise, go ahead and book it. As noted before, even though it is an older ship, it is well-kept, clean and the overall experience is fabulous.